I don’t really have much else to write about so i figured I’d do it on my favorite type of vampire, the Sampiro. Granted the reason its my favorite is for mainly superficial reasons. I’m also writing about since the only other source I’d heard of them came from Vampires: A field guide to the creatures that stalk the night. Granted this might end up sparking another post for the history of vampires in brief, but I digress. Going back to the superficial region of the above statement, it’s the description of the Sampiro that really struck out in my overactive imagination for how ridiculous it might look. Granted it strongly contrasted the eye candy illustration that accompanied it. What can loosely be called a base description of it’s appearance is that it’s cloaked in it’s burial shrouds, wears an imaginably uncomfortable pair of tall high heels threatening it’s balance, as well as large eyes that glow in the mist of night. Given that in the country of it’s origin, Albania, it’s appearance may vary but just slightly (pink zebra striped shrouds anyone?). In addition to what I find to be it’s amusing appearance it also puckers up giving it a kissy face. This is for the main reason that the poor dear is parched. Now just sit back a moment and close your eyes and take what’s been stated and imagine this in your head. One persons terror is another’s humor I suppose. The picture below gives a more kicking appearance though. To continue on it could be arguable that it’s also the most considerate vampire. It only takes a few mouthfuls before leaving it’s “victim” be, though it is warned that more attention can cause fainting and possible fatality. 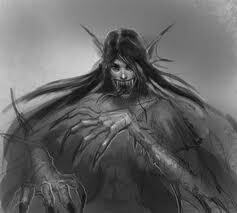 Resulting from it’s feeding habit it appears to be more of a nuisance than any real form of threat. So in a way one could compare it to any ankle biter of the world. Again given my only source is the book mentioned before I would consider this rather incomplete, but then again perhaps there’s nothing more to know about it. It’s a vampire where outside of it’s origin I find it has a hilarious appearance though if I were to run into one personally I’d might end up running from the Sampiro all the same. Disclaimer: there are a few other sources on the internet relating to this type and if one would want more information go to them. This entry was posted in Cryptozooligy and tagged explained, paranormal, Sampiro, vampire.